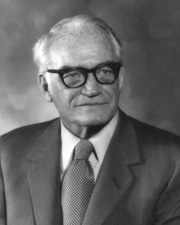 GOLDWATER, Barry Morris, (father of Barry Morris Goldwater, Jr.), a Senator from Arizona; born in Phoenix, Maricopa County, Ariz., January 1, 1909; attended the Phoenix public schools, Staunton Military Academy, and one year at the University of Arizona at Tucson in 1928; began business career in 1929 in family mercantile business; during the Second World War entered active service in August 1941 in the United States Army Air Corps, serving in the Asiatic Theater in India, and was discharged in November 1945 as a lieutenant colonel with rating as pilot; organized the Arizona National Guard 1945-1952; brigadier general in the Air Force Reserve in 1959 and promoted to major general in 1962; retired in 1967 after thirty-seven years service; member of advisory committee, Indian Affairs, Department of the Interior 1948-1950; member of the city council of Phoenix 1949-1952; elected as a Republican to the United States Senate in 1952; reelected in 1958, and served from January 3, 1953, to January 3, 1965; did not seek reelection to the Senate in 1964; unsuccessful Republican nominee for President in 1964; elected to the United States Senate in 1968; reelected in 1974 and again in 1980, and served from January 3, 1969, to January 3, 1987; did not seek reelection in 1986; chairman, Select Committee on Intelligence (Ninety-seventh and Ninety-eighth Congresses), Committee on Armed Services (Ninety-ninth Congress); awarded the Presidential Medal of Freedom on March 12, 1986; died May 29, 1998, at Paradise Valley, Ariz.; remains were cremated. Scribner Encyclopedia of American Lives; Dean, John W., and Barry M. Goldwater, Jr., eds. Pure Goldwater. New York: Palgrave Macmillan, 2008; Iverson, Peter. Barry Goldwater: Native Arizonan. Norman, Okla.: University of Oklahoma Press, 1997; Goldberg, Robert Alan. Barry Goldwater. New Haven: Yale University Press, 1995; Goldwater, Barry. With No Apologies. New York: William Morrow and Co., 1979.